RIP ChaoMi : BenMi.com domain tool is better AND in English! :DomainGang RIP ChaoMi : BenMi.com domain tool is better AND in English! Everyone’s been raving about ChaoMi, the Chinese domain tool displaying domain sales trends in China. Apparently, you’ve been wasting your time with it. BenMi, operating from BenMi.com, is a much better tool that provides a full English section. That’s right, no more translating stuff with funny results just to post the most recent prices in LLL.com, LLLL.com, NNNN.net and other combinations popular with the Chinese domain investors! BenMi, which means “crazy counter” in Chinese, provides detailed charts at the push of a button. You can select data from specific date ranges, as well. BenMi.com offers a live domain auction aggregator across several marketplaces. Want to see how action for your favorite four letter (sans A,E,I,O,U,V letters) .net is unfolding? No problem. 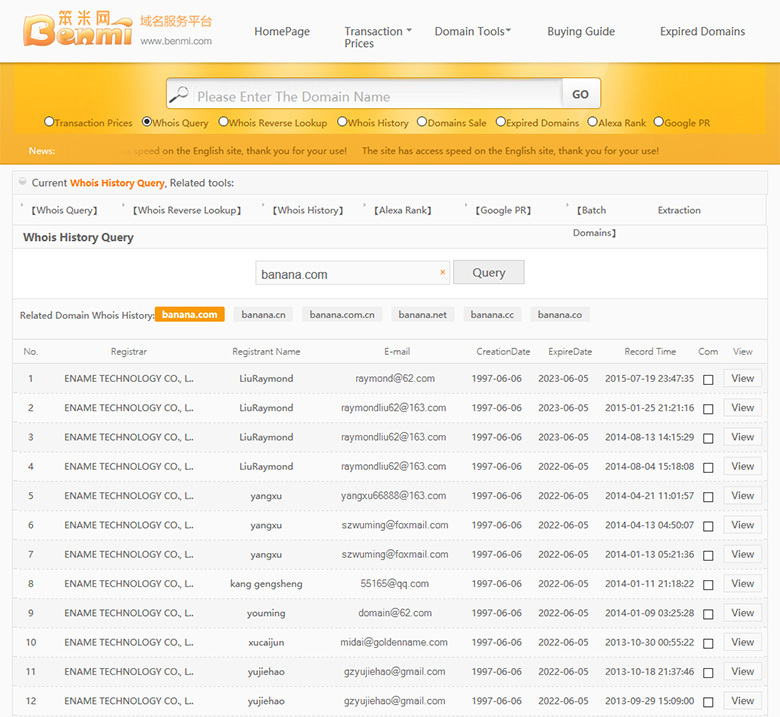 The beauty of the Chinese domain tool, BenMi, does not end there. Need a reliable alternative to the historic WHOIS of DomainTools? Try Banana.com and its many WHOIS changes, displayed in an easy to read format. 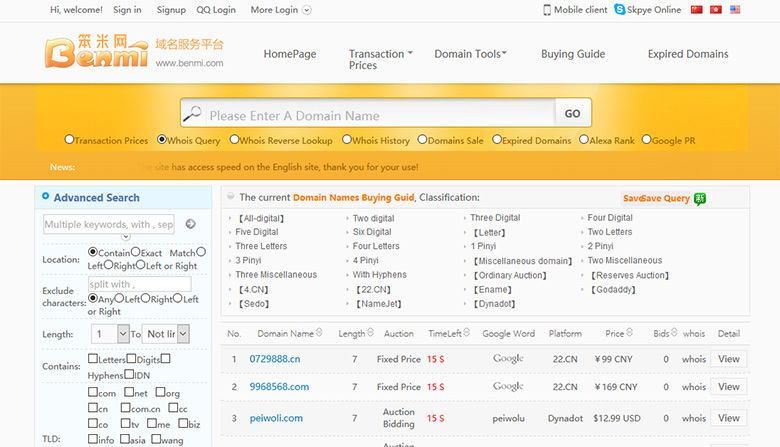 All these options – and more – make BenMi.com the indispensable tool in determining your next domain investment in – or withdrawal from – the Chinese domain market. For now, prices are listed in CNY only; hopefully in the future, the creators of BenMi will offer other currencies, such as USD as well. I thought the post was a gag!! Nice job!! Nice to see single digit .cc over $500k! Everyone knew .cc was the #2 choice beside .com. It is the easiest extension to type in the World. BenMi.com it dead ! Not working anymore here. Thank you very much for this new tool and now that domaintool charges some cash and the benmi.com is free and very effective. Cheers.